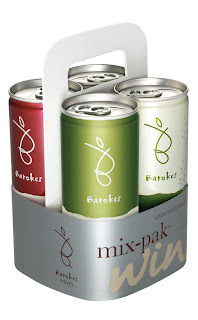 A lot of new wine brands created innovative packagings: Barokes and Lubie, to name just two brands I worked on for Wine Brands. Some “old” brands also launch wines under new packaging: this is the case of the long-lived German brand “Black Tower” now lauching a sparkler in cans. “The launch is part of a drive to turn the 1970s icon into a million-case-selling label by the summer”, writes decanter.com. The same is true of the young Bordeaux-based Lubie. In strategy, as well as in its products, it is a little more subtle and elegant than its American and Australian counterparts. Instead of aiming wildly at a “global” market, Lubie targets young and upper-scale consumers, mostly the young crowds in night clubs and the more mature wine drinkers in upscale wine and grocery stores in major cities. Their very first target is feminine, since they describe the wine as “feminine, natural, contemporary and self-indulgent”. Women are more sensitive to an elegant and unusual packaging. It is so much fun to show up at an evening with your pack of four small bottles of wine instead of a regular wine bottle! Barokes and Lubie are now reaching their audience after a few years on the market. Isn’t it a little too late for an ageing brand such as Black Tower to try to rejuvenate with a now banal packaging?